The results are displayed in Figure 34.1 and Figure 34.2. In Figure 34.1, the total chi-square statistic, which is a measure of the association between the rows and columns in the full five dimensions of the (centered) table, is 383.856. The chi-square p-value, < 0.001, is displayed when you specify the CHI2P option. The maximum number of dimensions (or axes) is the minimum of the number of rows and columns, minus one. More than 96% of the total chi-square and inertia is explained by the first dimension, indicating that the association between the row and column categories is essentially one-dimensional. The plot in Figure 34.2 shows how the number of doctorates in the different disciplines changes over time. 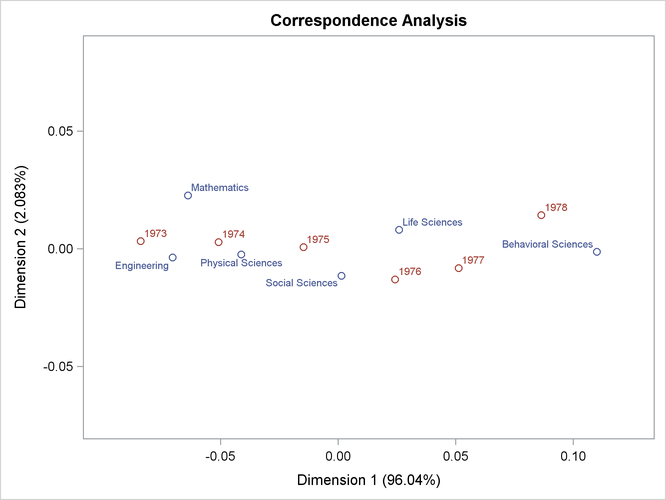 The plot shows that the number of doctorates in the behavioral sciences is associated with later years, and the number of doctorates in mathematics and engineering is associated with earlier years. This is consistent with the data that show that the number of doctorates in the behavioral sciences is increasing, the number of doctorates in every other discipline is decreasing, and the rate of decrease is greatest for mathematics and engineering.